In this video we see the formation of sea ice in winter and the melting in summer. The year is displayed in the upper right. Watch the sea ice melting over time. By 2012 there is dramatically more dark blue ocean and less ice than in 1979. The red dots represent the buoys that measure the ice. 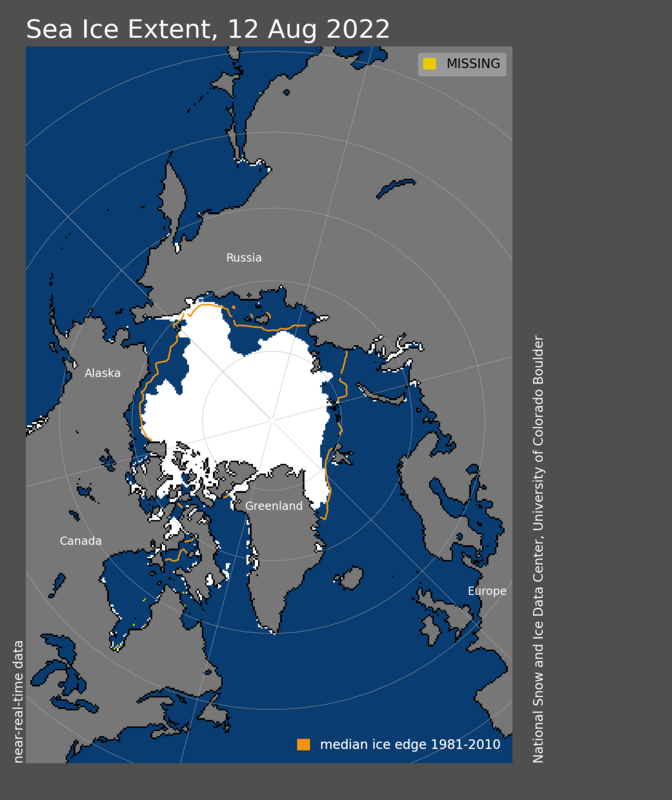 Below is a satellite aided image from the NSIDC showing a recent view of Arctic sea ice. In the map, the orange line shows the 1981 to 2010 median edge of the Arctic ice sheet. The white fill is based on recent date. This chart compares the actual loss of Arctic Ice Cap volume in 1950 and the projected loss by 2050. The more ice that is lost, the faster the ice cap shrinks due to the loss of albedo, the amount of light energy that is normally reflected back out into space by the ice cap. Image: NOAA and here. Experts agree that the age of the perennial ice cover exceeds 700,000 years but disagree about how much older it is. Worsley believed it was 700,000 years old. More recently, Clark wrote that Arctic Ice is 4 million years old. In either case it’s very old. To put it into perspective, 700,000 years ago is around the time when mankind first stood-up and made fire (source: UCR). The Arctic climatic changes that are taking place can have profound impacts on the Earth’s ecosystems, human health, plant and animal species. This may be great news for shipping companies waiting for the Northwest Passage to finally open up, but arctic nature, and for those of us who live in coastal cities, any news that ice is melting even faster than we thought is dire. The goal is Fixmaps.org is to educate those outside of science that the Arctic is melting. We think the best way to education the masses is by adding Arctic sea ice to Google Maps. This entails replacing the undersea topology maps that Google Maps currently shows with actual satellite imagery or ice measurements of the Arctic sea ice from NSIDC. After you sign the petition, you might enjoy reading The Inconvenient Truth For Santa Claus.